What is the Capital Region Family Business Resource Center? Click on the video below to get an introduction and hear from some of the members as to what they have gained from attending the monthly meetings. Fostering continuity of family and closely-held businesses by providing knowledge and experience for success and survival. If you are a family or closely-held business, please contact me to learn how you can benefit from meeting other owners and managers like yourself. Come as a guest to one of our roundtable meetings or programs to learn about the many benefits of becoming a member. I am always happy to visit with prospective members at their place of business. Simply give me a call at (518) 369-7101 to schedule an appointment. 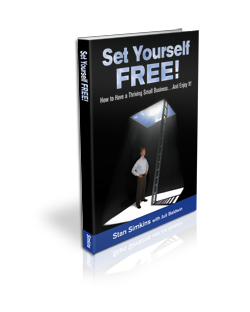 Be sure to check out the new book recently published by our Executive Director, Stan Simkins entitled "Set Yourself Free - How to Have a Thriving Small Business...And Enjoy It!" Now available on Amazon.com, Itunes, (including the audiobook version).